By adding the technology of graduated compression, this sport sock gives you the added benefit of improved circulation while performing any sport or leisure activity. You will notice your legs feel better at the end of any activity. Made with CoolMax a fiber that pulls moisture from the skin to be absorbed to the outside of the sock. It is thicker than a standard Nylon/Lycra Sock, with additional thickness around the entire foot area, giving a new level of comfort in a support sock. Ideal for athletics, walking shoes, golf and any casual or sporting activity. 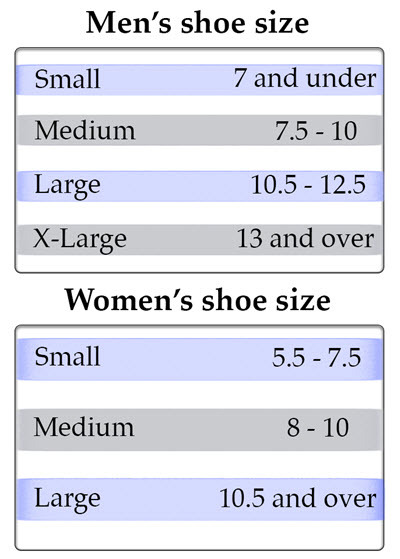 The thickness is about that of a traditional athletic sock, so no need to worry about larger sized shoes. Improved Recovery Therapeutic rated fabric provides greater pressure and recovery benefit leading to faster muscle repair. Improved Circulation Faster warm up and improved oxygen circulation. Encourages blood to the muscles and flush by products away. Reduced Fatigue Reduces muscle vibration (linked to muscle fatigue) improves muscle endurance and strength. Reduced Damage Performance Compression Sock muscle containment can reduce soft tissue damage in contact and intense sports. Preventative support and aided recovery. Heightened Proprioception Heightened body position sense for enhanced stability and agility. I really like these so far. Nice thickness. Can't imagine why someone would spend $60-70. for compression socks. I now have four pair of these socks, and my legs feel great when I wear them. Great Socks. Best I've tried. They do get a bit pricy but it's worth it. They fit well, they wear well and can take the washings. I take advantage of the sales when they come up. For sure! Very good compression sock at a reasonable price. My only little complaint is that the socks start to pull on your toes by days end. I normally don’t do reviews but I’m SO IMPRESSED with the product and service I just had write one (Model A106 - Athletic Socks). I tried them as a result of the reviews and I was so impressed I quickly ordered another 6.. Very pleased with the product AND THE SERVICE. Great fit.....easy to put on....comfortable......wash well. I'm a big heavy guy and I wear these as work socks in my safety shoes, both steel and composite toe. I've tried several "athletic" style socks from DS and these have the best combination of fit, quality, and durability. The toes and heels don't last as long as I'd like, but I'm on my feet on concrete 40 to 60 hours a week. And they're still better than others I've tried. Overall, very happy. We are not very good using the computer to review and order on line. I phoned and received very nice and helpful guidance. I purchased these for my disabled now-adult foster son. We needed to keep the costs down he didn't have the funds for the very expensive ones locally and his doctor wanted him to have some but his Medicaid would not pay for it by Rx. So off I went to find socks! He says they are very comfortable and we will probably order another set. He only has his right leg now so this gave him 4 socks for the right leg - his left foot/ankle amputated Oct 2015 and he lost his right big toe January 2016 to diabetes but he is doing much better, right now anyways. They wash up great, price FANTASTIC for my limited budget, and fast delivery, even during a blizzard where the store located. He is very pleased with them.